The Jeanneau Sun Odyssey 49 is highly regarded as a serious blue water cruising yacht. 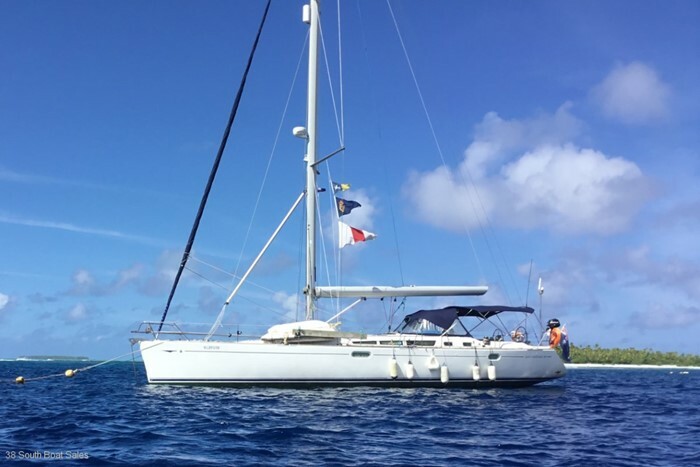 This one-owner, three cabin, two heads 2005 model has circumnavigated the globe and is equipped to go again. Sleek and stylish, the Sun Odyssey 49 also offers a high level of performance. This is a yacht for the adventurous sailor, easily able to cover long distances, but she is also designed to make your life on board easy and supremely comfortable. Her large galley, air conditioned owners cabin with island queen sized bed, twin spacious rear cabins, two heads with showers, numerous storage compartments, large chart table and generously sized and well protected cockpit have all been designed to optimise your comfort on board and to make your cruising lifestyle relaxing and enjoyable. Electric winches, Leisurefurl boom, headsail furler and a bow thruster make handling this lovely yacht a breeze while her auto-pilot, on-board generator and high output watermaker optimise your passage making convenience. She has a complete electronics package and up to date communications systems including Radar, Iridium Go and AIS. One of the most comprehensively equipped cruising yachts we have seen, the condition of this Australian Registered Jeanneau Sun Odyssey 49 has to be seen to be appreciated. Her hull was recently polished, her Coppercoat antifoul system refreshed and her teak decks and all teak interior are in excellent condition. If you are looking for a stylish performance passage maker with all the cruising comforts and in excellent condition, then you must see this yacht.